OK, I know that, technically, rolling up sushi has nothing to do with a cast iron dutch oven. I get that. However, in the last post, I did make the rice and the rice vinegar sauce in my dutch ovens, so that counts, right? With the rice all ready from the previous part, it’s time to prepare the filling ingredients. Here is a list of all the ingredients we usually gather to make our various sushi rolls. The meats needs a little bit of preparation. If the fish was frozen, it should be completely thawed, and patted dry with paper towels. I cut the skin away from the salmon. We usually use imitation crab. I know I should hang my head in shame, but at least we can afford it. I peeled the cucumber and quartered it lengthwise. I scooped out the seeds with a spoon, and sliced it lengthwise into very thin strips. I cut the carrots into long, thin strips as well. I arranged everything in the list of ingredients and tools around my cutting board, so that I could reach whatever I wanted to put into any particular roll. 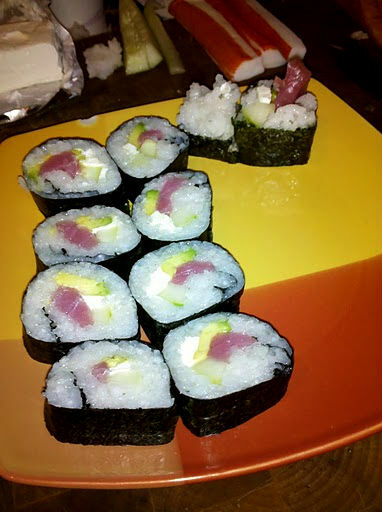 Finally, it was time to make sushi! I placed the rolling mat on the cutting board in front of me, so that I would be rolling away from myself. I put a sheet of nori, shiny side down, onto the rolling mat. Then I got my hands good and wet in the bowl and grabbed a palmfull of rice. I spread that out over the nori. There’s an art to even the spreading of the rice, which I have not yet learned. The trick is to spread it thinly and gently, without smashing the grains of rice. I’ve read that you should be able to see spots of nori through the clumps of rice. I’ve read about and watched lots of techniques. I use a whole sheet of nori and I spread enough rice to cover all but about ¾ of an inch at the far edge. Some use half sheets. You can play with it and see. Once the rice is spread, I lay my ingredients in a horizontal line, about an inch from the near edge of the nori. I start by slicing off a thin bit or two of tuna or salmon and laying that down. I put on any other ingredients I want, such as the cucumber or the carrots. You can sprinkle the sesame in at this point, but I like to sprinkle it over the sliced pieces when I’m done. Cream cheese is sliced off with a regular butter knife and laid onto the roll in strips. I have to resist the urge to put too much in a roll. I love to just keep putting stuff in, but I know that it muddies up the tastes, and it makes it harder to roll. If you or any of your guests don’t like the idea of eating raw fish, use the crab. I’ve even cooked the fish and put it in the sushi before, but I don’t like it as much myself. Once I’ve laid in my fillings, I curl up the near end of the rolling mat, with the nori, and curl it up and over the ingredients. I’ll often use my fingers to hold the ingredients in place as I’m doing the curl. I roll it over, and pull the leading edge of the mat away as it rolls the nori underneath. I squeeze as I’m rolling, but I have to be cautious not to squeeze too much, so as to keep the rice from smooshing. The last bit of nori, where there’s no rice, gets a little bit of water from my fingers, to help it seal. Then, with a couple of squeezes, the last bit of rolling was complete. I pulled the mat away, and picked up the knife. I wiped it with the damp cloth and in a couple of quick motions, cut the roll in half. I turn the two halves I’ve cut to be side-by-side. I wiped the blade again, and cut the slices of the roll together, two more times, to make a total of six pieces. I wiped the blade between each cut. Finally, each piece was set on the plate, with a dollop of wasabi paste and a few bits of the pickled ginger. Now, while it might not be as good as you’ll get in a fine sushi bar in tokyo, or even the more metropolitan areas of the states, it still tasted great, and I had a lot of fun making it, too!